We will cover PARTNER, PARENTS and CHILD VISAS. 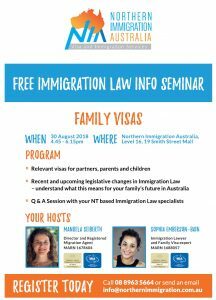 Employer Sponsored Visas workshop 31 August 2018 DARWIN. 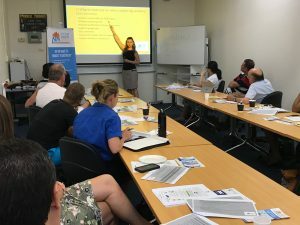 This workshop is for EMPLOYERS and will provide relevant information for both, businesses who are already sponsoring overseas workers as well as businesses who are considering to sponsor someone. The workshop will be focusing on the obligations for the employer and the significant changes since 12 August 2018, e.g. Skilling Australians Fund (SAF) levy, Labour Market Testing, etc. If you are getting sponsored by an employer, or are in the process of starting a sponsorship – tell your employer to register and attend the workshop! I wish to attend your free workshop about family visas with my friend Dono. Thanks for registering for our workshop. We look forward to meeting you and your friend at 4:45pm tonight! Our office address is: 19 Smith Street Mall, Level 16 – Paspaleys building opposite Westpac in the Mall. I applied for NT Visa 190 as an Aircraft Avionics Maintenance Engineer (323111) with 60 points (Sponsorship not included) on 12th DEC 2018? Do you know how long does it take to receive any answer from the NT? That’s great you applied for NT Nomination with 60 points! Did you apply from onshore or offshore? The turnaround time for onshore is 1 week; offshore takes at least 6-9 months or longer. It depends on your points, your commitment statement and your application in general. We would be happy to discuss this in more detail, if you wish. Please book an appointment online here with our Registered Migration Agents.